A student group at MIT drawing on a broad range of technical knowledge encompassing all fields of engineering and science. 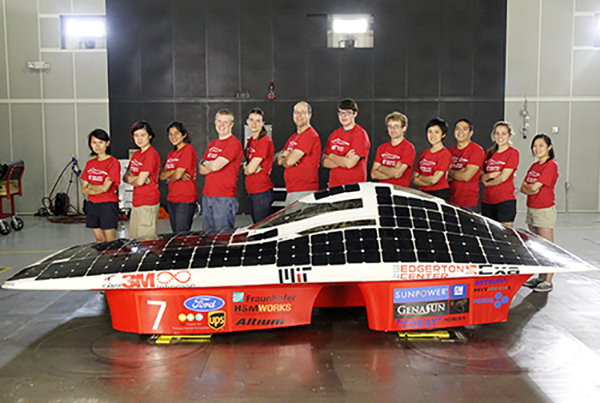 The MIT Solar Electric Vehicle Team is a student group at MIT, working under the auspices of the Edgerton Center. The team draws on a broad range of technical knowledge encompassing all fields of engineering and science. Membership provides an intense educational experience which teaches practical skills impossible to communicate in the classroom environment, turning students into engineers. In addition to providing real-world design and manufacturing experience, involvement in the team develops project management and business skills. The team also gives students the opportunity to work closely with professors and members of the business community, including those on the board of consultants, when developing the vehicles.